This outfit is very similar to outfit #1 in the “Striped Pencil Skirt 11 Ways” image below. I guess this week was accidentally a week long revisit of previously worn outfits with slight modifications. I never can't get enough from stripes and like the combo with the striped skirt and the navy shirt! What I like about this blog is that you show a more realistic side of styling. who has infinite funds to keep shopping for new clothes? Even if you repeat things, in my opinion that makes it more inspiring and achievable. I come to your blog because I like your style and it's attainable for me. I appreciate the fact that you do revisit outfits and I like to see how you style with different accessories. Completely agree with the above comments – I visit your blog because it's realistic! Real people re-wear outfits and honestly it's great to see the same outfit. It totally shows how to use what you already have. Keep it up. I second the other comments – it's bothers me not one bit if you basically repeat an outfit! And of course it's always helpful and fun when you put together your graphics of different ways you've worn one item. Your blog is one of my favorites because it's what you actually wear to work – it's been a great inspiration to me as I have been building my office wardrobe for the last couple of years! I also agree! I never mind your mixing and matching even if it just with a change of shoes or accessories. That is how I make my limited wardrobe go farther too! 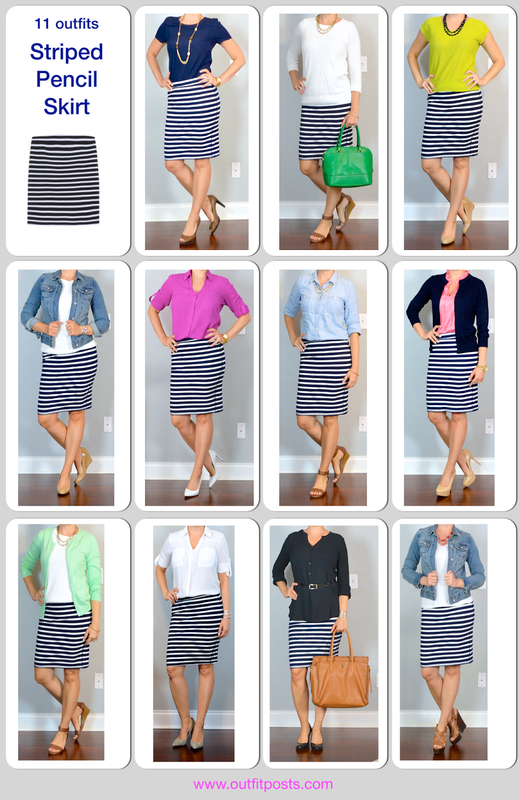 As a “real” person, I appreciate this blog so much for help and ideas for workwear dressing. I also read other fashion/style blogs and those girls always have a new piece of clothing which is why they never remix their stuff. As a working mom with a limited budget I need to find ideas on how to wear the same piece or even the same outfit multiple different ways. I LOVE the graphics where you show how you've re-styled the same thing X number of ways. Please never sell out and become what I refer to as a “shopping blog.” Keep up the good fight! Thank you for letting me know you enjoy it. It means a lot! That's wonderful to hear! Thank you! I'm glad you find the outfit compilations useful! Thanks so much! Sorry – talk to text -> rewear! That's awesome to hear. Thanks for taking the time to let me know. I really appreciate it!! Thanks so much for taking the time to comment. It's so flattering to hear you enjoyed the blog! I agree. You keep it real.